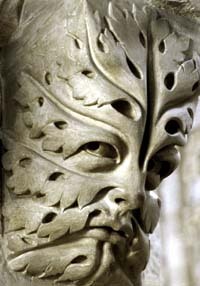 In the Middle Ages there wer people living on the fringes of society, misfits, outcasts, and outlaws, and their life in the forests took on a mythical character in the popular imagination, portrayed in the concept of the Wild Man, or, sometimes, Woodwose. (There were also Wild Women.) These wild men were not entirely antagonstic to the community, and they are illustrated during the Middle Ages helping farmers and others. The Wild Man idea came also to be associated with any forest dweller, so they are connected with foresters, and, of course, with Robin Hood, or Robin-of-the Wood. But from an origin in various tales, the wild man also developed to denote the natural man, not an abstract natural man in nature, but the natural being in each of us, the reservoir of talents, abilities, character, and flaws, that each of has to bring into the active service of our consciousness, the representative of Spirit in each of us, of God in each of us. Spirit and Natural Man are not in opposition, but they must be brought to work together, because the divine was held to be in both.